To actively serve the people of Rawlins County through the Rawlins County Health Center by building permanent charitable capital for providing services, equipment, and education that contribute to the health and vitality of the community. Rawlins County Health Center relies on the support of individuals like you to help us provide quality health care for the people and communities of northwest Kansas. We know each person’s level of interest and circumstances are unique. That’s why we invite you to explore the many ways you can give to RCHC and join our community of support. Once you decide to donate, you can make an unrestricted or restricted gift. By choosing unrestricted, you let the RCH Foundation Board place the funds “where most needed.” This allows flexibility of using funds that meet urgent needs or to invest in the future. 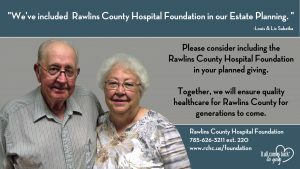 There are numerous ways to give a tax-deductible gift to RCHC through the Rawlins County Hospital Foundation. Checks: Please make your check out to RCH Foundation/ACE Affiliate and mail to P.O. Box 47, Atwood, KS, 67730, or deliver it to RCHC attention to the Foundation Manager. Planned Gifts or Bequests: You can designate the RCH Foundation as the recipient of all or a portion of your estate, retirement plan or life insurance. You also can transfer securities, real estate or other personal property. If you are considering one of these gifts to the RCH Foundation, please consult with your attorney, tax consultant and the RCH Foundation Manager for arrangements. Pledges: Pledges of any amount are always welcome. Commodities: Bushels of grain are welcome as a pledge or donation. Wheat, corn, sorghum, sunflowers, oats—even livestock—are accepted as well. Volunteering and In-kind Donations: Please call or visit the RCH Foundation Manager to volunteer your services or prior to donating a tangible item to the Foundation. A designated representative must determine if the item would fulfill a need at the hospital. Memorial or Tribute Gifts: Once you select unrestricted or restricted gifting, you can choose how you would like to remember or pay tribute to a family member or friend. Please discuss this with the RCH Foundation Manager. The Rawlins County Hospital Foundation conducted a successful $1.25Mil 5-year capital campaign in 2012. The Complete the Dream…Continue the Vision Capital Campaign was created to raise funds to help complete the massive construction project that has been taking place over the last few years at RCHC. The facility went through a major renovation and building project including the Physical Therapy and Cardiac Rehab, Accounts Receivable, Front Desk, Acute Care, Emergency, Laboratory and Radiology departments. The facility also finished up a new Clinic area which allowed space for the Specialty Clinic as well. Those spaces, along with various other areas including the chapel and front entrance, have created a state-of-the-art facility to continue the mission of bringing quality health care to the community for years to come. While the capital campaign helped complete the construction of our facility to date and provided some much-needed equipment, in order to position ourselves for sustainability into the future, our next big project is a refresh campaign to ensure quality healthcare for the future. The refresh campaign will open the opportunity for donors to contribute to a growing Endowment Fund, or to contribute a one-time or 5-year pledge to continue providing Rawlins County Health Center with the funds to improve healthcare with equipment and renovations. Please contact the RCH Foundation Office @ 785-626-3211 ex 220 if you are interested in finding out more information regarding memorial donations, wish lists, endowments and campaign donations. Rawlins County Hospital Foundation supports and assists Rawlins County Health Center with needed services and equipment. By giving to the RCH Foundation, you help us fulfill our hospital’s mission to improve the health and quality of life of the individuals and communities we serve now and into the future. The RCH Foundation was established in 1988 with funds from memorials and bequests. In 2002, the Foundation became an affiliate of the Area Community Enrichment (ACE) Foundation, so that it can be considered a fully qualified charitable organization with a principal fund of its own.